1 of 9 Heat oven to 375 degrees F. Lightly oil 8 x 8 x 2-inch glass baking dish. Bring large pot of lightly salted water to boiling over high heat. 2 of 9 Combine chicken, 3/4 cup water, wine and garlic in saucepan. Bring to boiling over high heat; reduce heat; gently simmer, covered, 15 minutes. 3 of 9 Remove chicken from broth and set aside to cool. Measure broth, adding water if needed to make a total of 1-3/4 cups. Tear chicken into about 1/2-inch-wide shreds. 4 of 9 Place wet spinach in large nonreactive pot; cover; cook over high heat until wilted, 3 minutes. Drain, lightly pressing out excess water. Coarsely chop; return to pot. 5 of 9 Heat oil in saucepan over medium heat. Stir in flour; cook 1 minute. Stir in reserved 1-3/4 cups broth mixture; cook, stirring, until thickened and smooth, 3 to 4 minutes. Add lemon juice, oregano, salt, pepper and nutmeg. Bring to boiling. Remove from heat. Stir in cream cheese and 1/2 cup Parmesan. 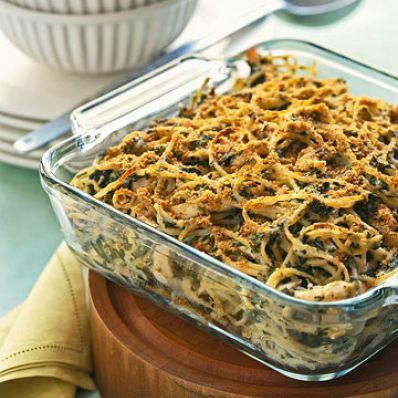 6 of 9 Add cheese sauce and shredded chicken to spinach in pot. 7 of 9 Meanwhile, add linguine to boiling water; cook until firm but tender, 9 to 10 minutes. Drain; add to spinach mixture. Turn into prepared casserole. 8 of 9 Combine remaining Parmesan cheese, bread crumbs and paprika in small bowl. Sprinkle over top. 9 of 9 Bake in 375 degrees F oven about 30 minutes or until golden and bubbly. Let stand at least 15 minutes. Serve.